Jacques is a woodcutter who spends each winter cutting trees in the forest. His wife, Finette, is lonely, until the seigneur starts visiting her and feasting on her delicious meals. When Jacques asks Finette to ask the seigneur to stop coming, Finette pretends to have a toothache and sends Jacques all the way to town for wine to cure it. On the way he meets a pedlar who devises a scheme to help Jacques catch the seigneur visiting his wife. Usually, in an illustrated folktale like this one, the words come before the pictures. In this book, the pictures came first. My friend Ann Blades did the charming watercolours for this story when it was published in another version called JACQUES THE WOODCUTTER. When that book went out of print, Ann's publisher asked me to write a new version of it. It was great fun to do! First I read many versions of the story in English and (with the help of a dictionary) in French. The only part I made up entirely were the songs. Then I tried to match the words exactly to each picture. 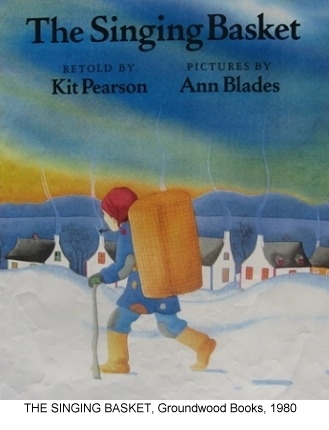 This book has sometimes been criticized for being unsuitable for children. I don't find that a problem. Kids will understand the real meaning behind the story when they are old enough to, and until then they will simply enjoy a rollicking tale. And, as in all good folk tales, the weak characters - Finette and the seigneur - learn their lesson and all ends happily.